The notes function is fairly straightforward. It allows you to make notes for a contact. This is a useful tool that can help you remember specifics about a person that their profile may not include. For example, where you met, what you talked about, or what you have in common. When networking and trying to nurture leads, this will be very helpful, especially as it is private. At the time this blog is being written the reminders function is only beneficial to those people who are actively using LinkedIn. This is because their notification for reminders isn’t as effective as it could be; I expect this to improve in the coming months. The function allows you to manually set a reminder for a specific contact, as well as type in a duration of time to be reminded. The tags function allows you to categorize your contacts based on obvious groupings such as colleagues, connections met at specific conferences or events, friends, etc. When you’re on your connections page, you’re able to filter by tag, which will help when targeting your connections in the future. 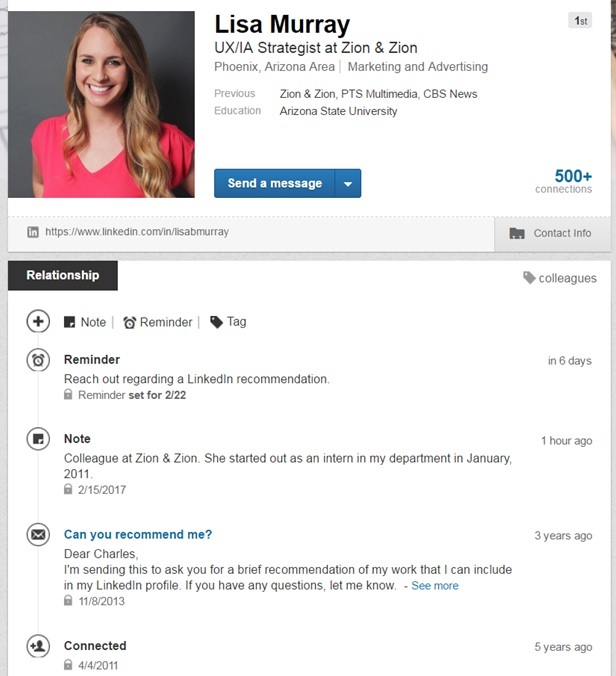 If you’ve been on LinkedIn for a few years, and/or you have a ton of connections and only use LinkedIn for personal use, you may want to start by only tagging new connections moving forward. If your goal on LinkedIn is business oriented (i.e. lead generation), you’ll want to invest the time into adding a tag for each of your existing contacts. Do you ever get annoyed when people try to connect with you on LinkedIn via your work email address? It makes sense, because that is how they’re professionally connected to you, however if you’re a veteran LinkedIn user, you may have created a separate account associated with your work email address just for this reason. Or worse, you may have created both a personal and a professional account. 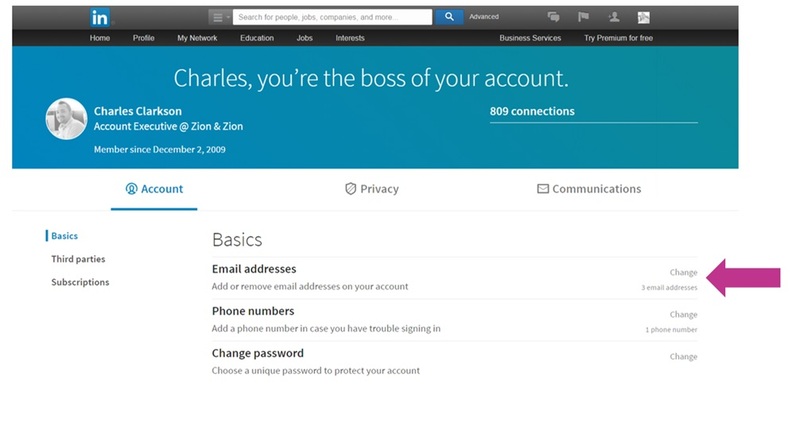 Did you know you can associate multiple email addresses to your one account? This means you can connect with people from your work email address and your personal email address! This also means connections from your current or past employers, as well as those you may know personally from college and throughout the years, can easily add you as a connection. Once you change employers, simply swap out the email address. To access the email address setting, first you must log in. Then simply click on your profile icon in the top right of your screen. In the menu dropdown, to the right of “Privacy & Settings” click on “Manage.” The email address setting is the first listed at the top of the page, under “Basics.” It’s that easy! Note that every once in a while, it’s a good idea to take a moment to review your security options and settings. I recommend doing so (at least) quarterly to see how things have changed, and to see what you may have been opted into by default. This means that if you work for a certain company and also sit on the board for a local organization, so long as both are listed and the status is current for each, all of your contacts are going to get notifications for both roles. Why should you care? Simply put, if you change jobs or roles and don’t make the update on LinkedIn, it gets awkward. Awkward when you’re suddenly getting congrats from your connections about an anniversary for a job you no longer hold. Awkward for old co-workers who are going to get these notifications relating to their company. Awkward because now people are aware you don’t pay attention to LinkedIn. You can see where this is going. When you click to edit your profile, you’ll see lots of potential sections you can add to your profile, most of which may not apply to you or your profession. 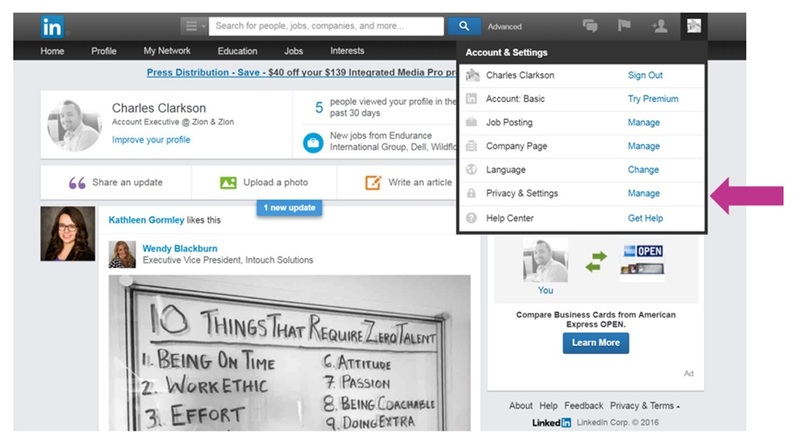 For the average LinkedIn user, the number of options may seem daunting. However, there is one feature that people often underutilize, which could help leverage them as an expert in their fields: certifications. For example, if you work in marketing, there are a lot of conferences, programs, courses, etc. out there that you’re likely already participating in. While you may have specific reasons for why you took that course, don’t forget you can also use it to further market yourself on LinkedIn. For instance, if you have a Google Analytics certification, you should include it in your LinkedIn profile and increase your validity in your field. When you first create your LinkedIn profile you may not have something to include in the certifications section, but if you take a little time to think and research, you’d be surprised what you can come up with. There are professions where the certifications section makes 100% sense to utilize, such as the legal field. However, in marketing, this can be one of the trickier sections on LinkedIn because as time goes by, you need to start training yourself to realize, “Oh hey, that would fit great in the certifications section of my profile.” Give it a thought, and see what comes of it. 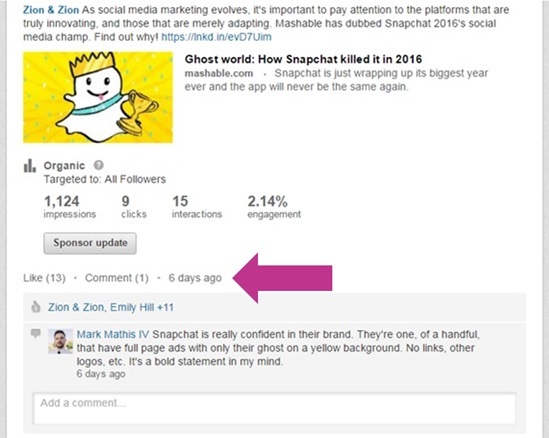 If you work in social media, or are simply the person in charge of your company’s LinkedIn page, there’s a little-known way to let people know about a single company page post: the time stamp. 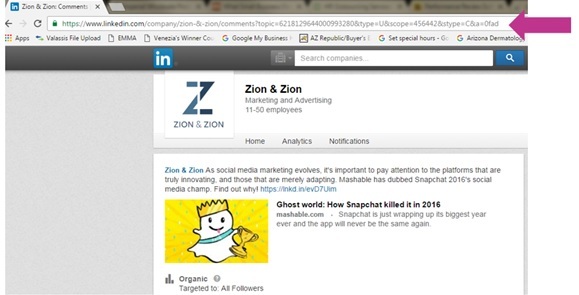 Simply stated, once a post is published to the company page, you can click on the time stamp, and it will take you to that post’s unique URL. With this simple trick, you can share an individual post with colleagues, friends and connections, so that they can quickly and easily view the post. Other social networks like Facebook and Twitter have this same function, however LinkedIn has been known for being less user-friendly for social media marketers than other platforms; for example, you still cannot tag professionals or companies in a company page post. Similarly, note that as an admin for a company page, if you like the post in any setting other than in your personal LinkedIn newsfeed, you will be doing so as the company, not yourself. Only in the newsfeed can you like your company’s post as yourself. As you can see there are many tips and tricks for navigating through LinkedIn, so hopefully you find these tips helpful in your personal and business use.